You're too busy to worry about scheduling a conference room! That's where we come in - Remote Counsel takes the added burden of finding a room away from you. We have access to thousands of the best videoconference rooms around the world. And because we're the only comprehesive platform on the market, your room will be compatible with videoconference systems, Cameo, and more. Click on the link at the bottom of this page to waive your first scheduling fee when you book a room with Remote Counsel. In the meantime, enjoy some of our favorite conference room moments in The Office! After some of the Dunder Mifflin employees comment that prison sounds better than work, Michael attempts to change their minds with his alter-ego "Prison Mike." Hilarity ensues. After Michael names him his successor as Regional Manager, Dwight immediately begins enforcing his management style on his colleagues. This includes awarding "Schrute Bucks" to employees who have done their job well. 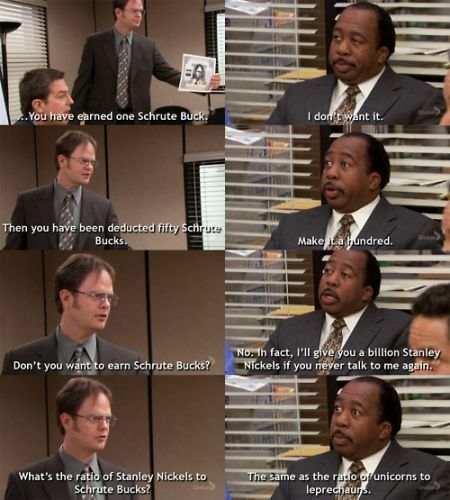 Employees who earn 1000 Schrute Bucks receive an extra five minutes for lunch. As you can see in the conference room scene above, the incentive was not successful. You can watch the full scene here. When employees at the Scranton branch of Dunder Mifflin learn the company is in financial trouble, Michael decides that a Murder Mystery game will take everyone's minds off the bad news. In order to maintain the integrity of the game - called Belles, Bourbon, and Bullets - Michael insists everyone speak with a southern accent. Oscar's attempt is hilariously off the mark. Jan, Michael's former boss and current girlfriend, is suing Dunder Mifflin because she believes she was wrongfully terminated. During the course of the deposition, Michael's original role as a witness against the company falls apart. Have you ever had to read back such a ridiculous transcript? Around our office, this is one of the most quoted scenes in the series. Due to Jan's irresponsible spending, Michael is forced to take a second job at night to earn extra income. This causes him to be unprepared for a PowerPoint presentation at Dunder Mifflin (although, did he ever need an excuse to be unprepared before?). You can watch the full scene here. The Office had a gift for making excellent holiday episodes (see what I did there), so it's hard to pick just one scene from them. This was one of our favorites: watch Darryl fall after a quick dance move onto the holiday party refreshment table. One of the best parts of The Office is the banter and pranks we get from Jim and Dwight, like in this episode when Kelly lies about their customer survey results. We might be immature, but we still crack up whenever Jim says "I am Bill Buttlicker" with a straight face when role playing a sales call with Dwight. Really? That's your real name? It's the simple things in life. As Michael drones on at yet another pointless meeting, the staff becomes fixated on whether or not the DVD logo cube on the conference room TV will bounce into the corner of the screen. The best part? Michael has no idea that their reactions have nothing to do with his presentation. After the Stamford branch merges with the Scranton branch of Dunder Mifflin, Michael creates an orientation video based on SNL's Lazy Sunday aptly titled Lazy Scranton. We were teased with Michael's screenplay of Threat Level Midnight throughout the entire series, and towards the end of the seventh season, it finally premiered in the Dunder Mifflin conference room. There were several funny scenes (including Do The Scarn) but seeing Michael's glee at Toby's head being blown up in the movie fully encompasses their tense relationship throughout the series. 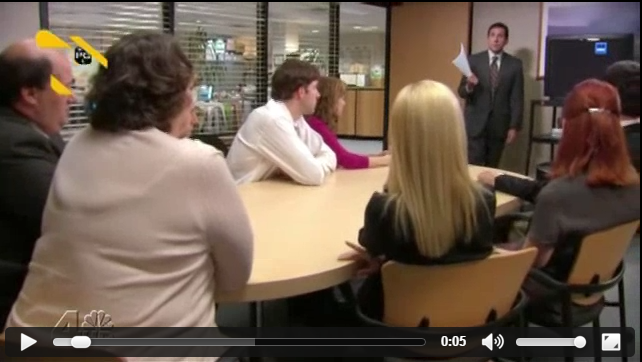 Did we miss any of your favorite conference room scenes from The Office? Let us know in the comments below! And be sure to continue the conference room fun by heading to our website and filling out the form to get your first scheduling fee waived when you book a room with Remote Counsel!